Our objective is to develop a computational model to predict visual attention behavior for an embodied conversational agent. During interpersonal interaction, gaze provides signal feedback and directs conversation flow. Simultaneously, in a dynamic environment, gaze also directs attention to peripheral movements. 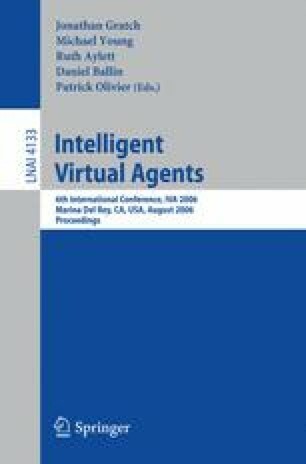 An embodied conversational agent should therefore employ social gaze not only for interpersonal interaction but also to possess human attention attributes so that its eyes and facial expression portray and convey appropriate distraction and engagement behaviors.